So the laid back mama succumbed and insisted DinoBoy sit down to do the assessment books she bought months back. And this mama is NOT happy about it, that explains why the books are out only NOW even though she has been saying that "I'm going to let the boy do, especially during the June holiday." the books are still on the shelf, looking brand new and every thing. This photo was taken yesterday night while we were doing the assessment books, the night before went smoothly and without any outbursts. Yesterday night was not good because we were doing Chinese. 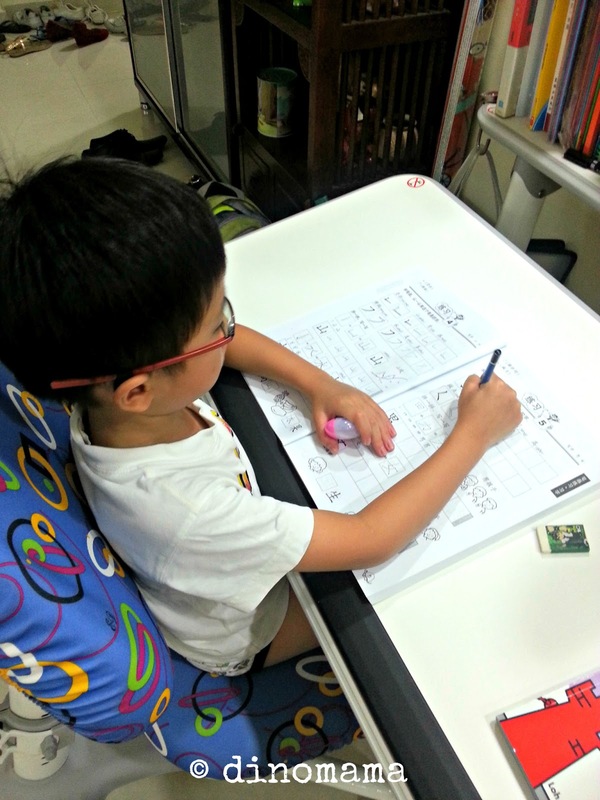 DinoBoy was reading a passage that is about a bird and a fish, he struggled with the pronunciation of the word 鱼 fish. This was supposed to be read at 2nd tone but he kept reading it at 3rd tone which is 雨 rain, making no sense in the passage. I made him repeat the word a few times, made him repeat the passage/sentence and he still said it at the 3rd tone. Both of us were feeling frustrated and when DinoBoy cried DinoPapa stepped in, taking over the job of accompanying him finish reading the passage. Thinking back, when I was still schooling I love assessment books (except Maths which is my killer subject) and I will do books and books of them, scoring them and feeling satisfied. However, I know my way will not work with DinoBoy and his body will auto shut down when he is stressed up or when I am very fierce and stern with him so I tried to be lenient with him. We have tried doing some of the assessment books earlier this year and it was not a happy experience; which is also part of the reason why I dread bringing them out. Most of the time I cannot control my temper because he makes the same mistake again and again. Sometimes I want to take his shoulder and shake him hard, to make him wake up or at least his learning department in the head start to work. How can a person forget the same word when you just read it on the previous page, less then 5mins ago???? Well, whether we like it or not, we still have to do it, I just have to find some ways to make the learning less stressful and more beneficial to DinoBoy. Raised voice? There probably will have some if not a lot. Tears? I hope there will be none. I know I have been sucked in to the "dark dark side" (non Star Wars related) and going against my stand but I just can't help it! Especially when it comes to Chinese subject, he is still not that good. I know I should have just let go and let him learn on his own, encourage him to read more Chinese books instead of shoving the assessment books at him. Sometimes I am too tired to read that 1 book with him and then my temper will be short turning a reading session into a scolding session. Arrgghhh!!! I can't take deep breaths and relax!!!! I have an urge to chuck those dreaded assessment books out of the window down the rubbish chute NOW!!!! Ahh . . . the struggle to learn! 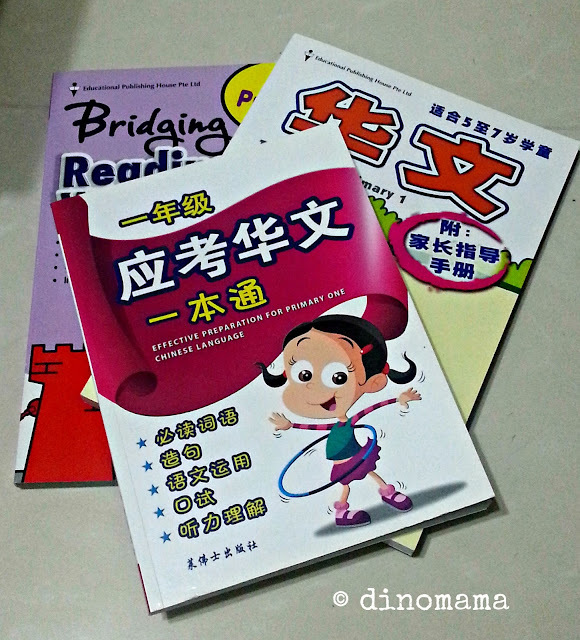 I am not familiar with assessment books and learning Chinese - but I wonder if there is another way that is "more fun". Perhaps graphic novels/comic books written in Chinese. Or he reads the book while he is outside. Or when he makes the same mistake over and over (HOW FRUSTRATING!) you make a rhyme or silly story to help remember the right way. Not sure if any of these will help . . . but I'm cheering here for you - and your DEEP BREATH! I enjoy your ranting haha.. I have similar struggles with my boy especially. My gal is ok as long as I told her to do assessment while I go to work, she'll do it. But for my boy, he can write one word, walks two rounds around the house and come back again. It's frustrating and gets on my nerves. I am trying to find a good way to let him sit down and learn, however, understanding boys are diff from gals, I know it's just not him to sit down for rote learning. Hence, I am still trying to find out his best learning style. So, if you or anyone have suggestions, please share with me!